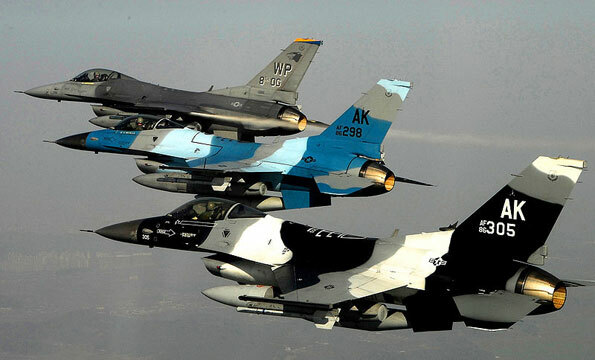 FORMATION TRAINING – Three U.S. Air Force F-16 Fighting Falcon Block 30 aircraft from the 80th Fighter Squadron fly in formation over South Korea during a training mission, Jan. 9, 2008. U.S. Air Force photo by Tech. Sgt. Quinton T. Burris. The General Dynamics (now Lockheed Martin) F-16 Fighting Falcon is a single-engine fighter aircraft originally developed by General Dynamics for the United States Air Force (USAF). General Dynamics sold its aircraft manufacturing business in 1993 to the Lockheed Corporation, which in turn became part of Lockheed Martin after a 1995 merger with Martin Marietta. The Fighting Falcon desirable features including a frameless bubble canopy for better visibility, side-mounted control stick to ease control while maneuvering, a seat reclined 30 degrees to reduce the effect of g-forces on the pilot, and the first use of a relaxed static stability/fly-by-wire flight control system which helps to make it a nimble aircraft. Image is a work of a U.S. Air Force Airman or employee, taken or made during the course of the person’s official duties. As a work of the U.S. federal government, the image or file is in the public domain.